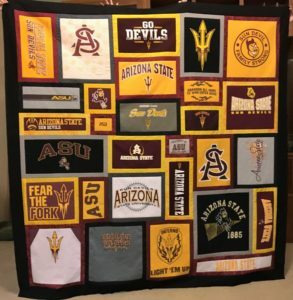 If you love Arizona State University, you’ll want to attend No More Chilly Nights and bid on this quilt! It is approximately 70×70… a large throw, just short of a twin. No More Chilly Nights is the annual fundraiser for the Clothes Cabin, a clothing bank located in Chandler, AZ, for anyone who needs clothing. Clothes Cabin operates with volunteers and donations of funds and clothing, and lots of love and respect for the people they clothe. If you want more information about Clothes Cabin and its fundraiser, visit http://clothescabin.org/no-more-chilly-nights-2018/. This is the third year I have contributed a quilt to the Clothes Cabin, an organization near and dear to my heart. In addition to this completed quilt, you will be able to bid on a custom Memory Quilt using 20-30 of your own T-shirts or other memorabilia! Hope to see you there.